Designed by internationally known architect Will Bruder, the Donald W. Reynolds Center for the Visual Arts is a four-level, 70,000 square-foot building that has become one of the most distinguished architectural achievements in Nevada. 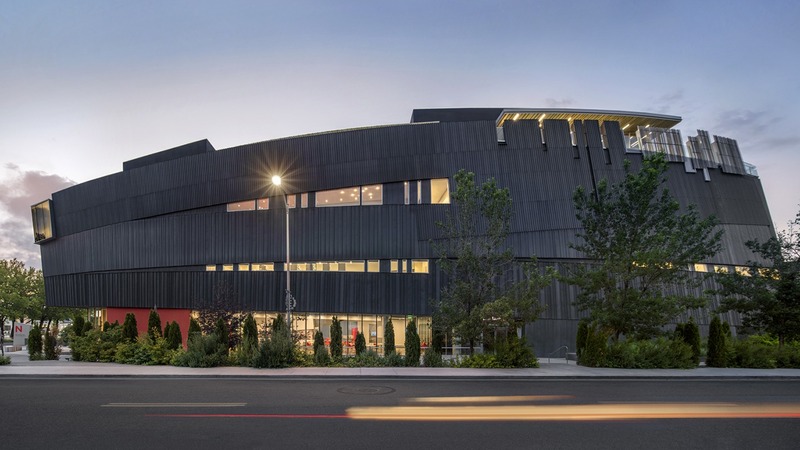 Inspired by the landscape and the unique geological formations of the Black Rock Desert, the Museum is a striking addition to downtown Reno, an architectural icon, and an environmental statement about our surroundings. The design for the Museum incorporates Bruder’s sculptural design style and highlights his unique sense of space, movement, materials, and light. A second major expansion was completed in 2016 with the transformation of the fourth floor, where the existing outdoor plaza was enclosed to create a year-round event space. Boasting spectacular mountain views, the space has been renamed the Fred W. Smith Penthouse, Nightingale Sky Room, Stacie Mathewson Sky Plaza.